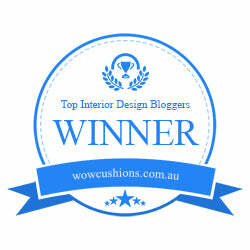 I have been managing whole house remodels for most of my twenty year career in Interior Design. The biggest mistake I see people make is hiring the contractor before they have a plan. A plan puts everyone on the same page. A kitchen or master bath needs a detailed plan just for those rooms. If you are using the architectural plan there is not enough detail to get a proper bid for the project. 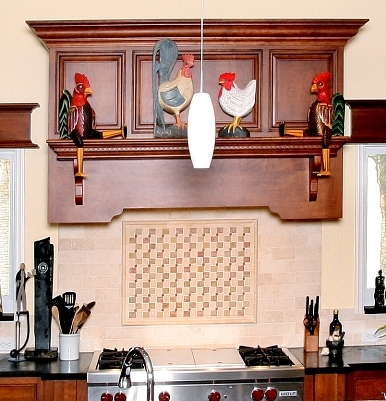 As you can see in the kitchen above the amount of detail that goes into a custom kitchen. The layeredcountertops have to be engineered and involve steel supports. A template has to be made and that involves labor and material. Three different materials are coming together to create this custom island and all transitions have to be designed on plan and coordinated with the subcontractors. All of the materials are expensive and it would be ashame to not have it done right and the only way to do that is a diagram illustrating this detail. Plans are the communication between the trades and the designer and without that these types of details would not turnout correct. If you are just given an allowance by the contractor for a tile backsplash, I assure you it will fall short. Once again this is an important detail in your kitchen design and must be thought about and designed on plan and then implemented. Notice the horizontal transitions from the window sill align and the vertical sides of the mosaic align with the vertical lines of the hood. A person setting the tile would have probably run the tile between the window casing and it would have looked unfinished at the top of the tile, not a good look. There should always be a tile plan with your kitchen plan so that it is not left open for the person in the field to decide. How important is the molding detail? VERY important! I promise you that if you put an architectural plan out for bid, typically the plan does not have kitchen cabinetry molding details and the cabinet shop putting out a competitive bid will just have a one piece molding. The construction of your cabinet door and how it lays on the box will dictate whether it is a two piece molding or a one piece molding. If you have an overlay door then you must have a two piece molding because the door sits out 7/8″ beyond the cabinet face. 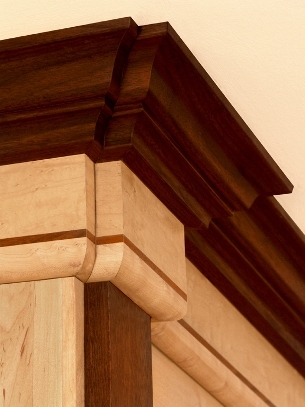 Using a cornice piece to build the crown out allows you to see the full detail of the crown molding which would be lost if it were set back. 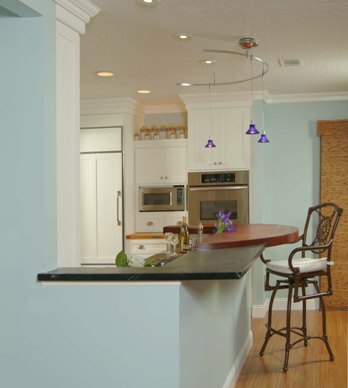 Another reason you might use a two piece molding would be if you were building the cabinetry up to ceiling which would allow you to scribe to ceiling without any problems as seen in the picture below. 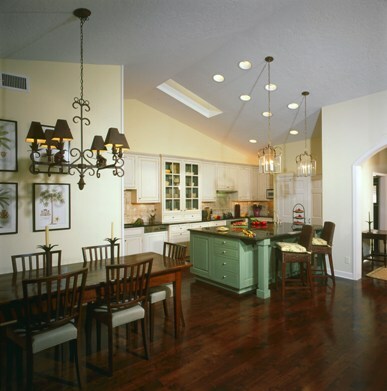 Another important detail to your kitchen or bath plan is a proper lighting plan. 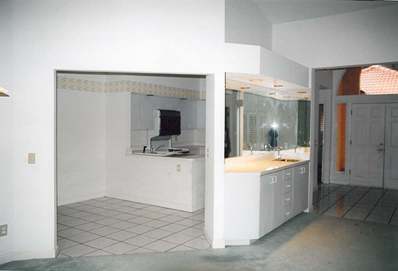 Most architectural plans have a generic grid shown for the kitchen lighting plan. 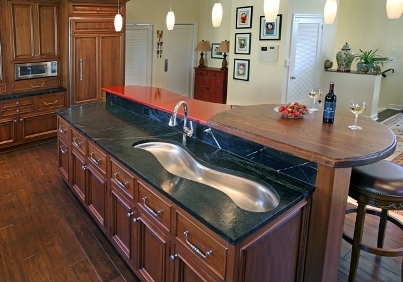 The kitchen should have a layered design that uses different zones of light for task, general and ambient lighting. This gives the user control of their settings. We all see differently and by having dimmers at all zones gives you the ability to have enough light while doing a task or just setting the light levels for a comfortable feel. 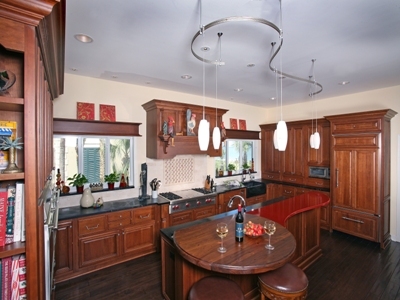 You can see how this lighting is fitting this kitchen. If you decided to not have the decorative pendantsthen you would use a pinhole recessed fixture that would throw a tight beam spread at the counter giving ample lighting at that specific area. 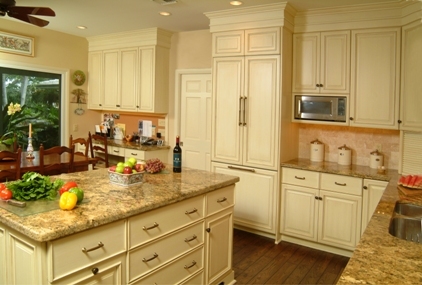 I recommend using a professional designer, certified in kitchen and bath design when putting in a new kitchen. As you can see there are many aspect to the design that need close attention and a qualified person to implement. Working with a professional you have someone on your side. Design is cheap in the long run and will save you lots of money by eliminating change orders. Be sure to check out my on-line plans store, www.professionalkitchenandbathplans.com and see the three different packages to meet anyones budget. Remember, if you fail to plan you plan to fail.